This chapter explains about midwifery in Iran. 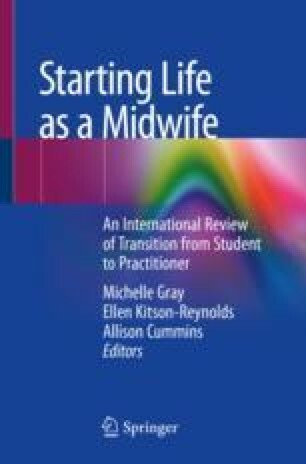 Details are related to the background and definition of midwifery in Iran, the legislation related to regulation of midwifery, the regulation related to initial and ongoing registration, a brief outline of the education leading to the registration as a midwife, the transition of new midwives after registration, and a reflective experience written by a new midwife in their first year of practice. The first section of this chapter is an overview of midwifery background and the significant decline in maternity mortality rate in Iran due to governmental efforts in expanding preventative health facilities across the country. The main focus of the second section is on the legislation, regulation, and essential education related to midwifery in Iran. The third section is related to an experience written by a new midwife regarding all the challenges, barriers, and supports experienced by her during her work at a health-care clinic in Tehran (capital of Iran). International Confederation of Midwives. ICM international definition of the midwife. 2017. http://internationalmidwives.org/who-we-are/policy-and-practice/icm-international-definition-of-the-midwife/. Accessed 3 Dec 2017. Nursing and Midwifery Council of UK. Registering as a nurse or midwife in the UK: information for applicants trained outside the European Union or European Economic Area. 2017. https://www.nmc.org.uk/globalassets/sitedocuments/registration/registering-nurse-or-midwife-outside-eu.pdf. Accessed 21 Jan 2018. Tehran University of Medical Sciences. History, Tehran; School of Nursing and Midwifery. 2017. http://fnm.tums.ac.ir/aboutus/history/lang/En.aspx. Accessed 3 Dec 2017. World Health Organisation. Nursing midwifery services strategic directions 2011–2015. 2010. http://www.wpro.who.int/hrh/documents/nursing_and_midwifery_services_strategic_directions.pdf. Accessed 1 Jan 2018. World Health Organisation. Maternal mortality in 1990–2015: Iran (Islamic Republic of). 2015. http://www.who.int/gho/maternal_health/countries/irn.pdf. Accessed 20 Dec 2017. World Health Organisation. Nursing and Midwifery (Islamic Republic of Iran). 2017. http://www.emro.who.int/irn/programmes/nursingamidwifery.html. Accessed 2 Dec 2017.